It's Friday! Who's ready for the weekend? It's summer and I still get excited about weekends. I won't even bother asking if I'm weird because we all know the answer to that question. 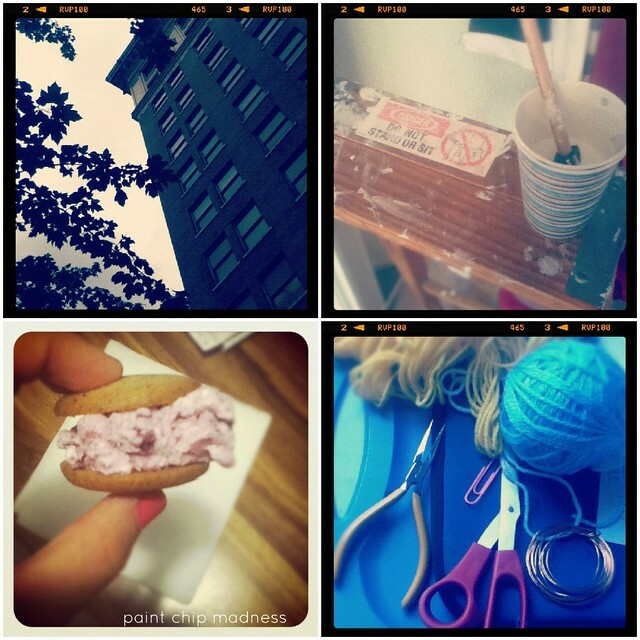 city travels // paint touch-up // homemade mini ice cream sandwich // crafting. those are crafting pliers, btw. Anyway, Friday's wouldn't be complete without some highs and lows from the week. And I've decided to add in a few links to love as well. Only because I really really miss sharing them. Running out of gum. For a girl like me who loves her sugarfree chewing gum, running out is not a great feeling. Seeing this cute stop-motion baby announcement video. Katie is a creative genius. Painting my toenails blue. And my fingernails a super bright pink (at least to me). I'm turning into a nail polish addict. I'm just dying to get my hands on a mint green color. Any recommendations? Making pie! So exciting. They're no your classic pies, per se. But they're just as yummy. And super easy to make. Which is perfect for hot summer days, right? I'm a LEGO fan. Starting now. Flip-flop tans. Even if they're faint, they're the best. That is all.